The 23-year-old from Indianapolis, Ind., amassed 90 pounds, 6 ounces over four days of competition on Chickamauga Lake. His margin of victory was 5-10 over arguably the best angler on the planet, Bassmaster Elite Series pro Kevin VanDam, who stepped up from third place to finish as runner-up. 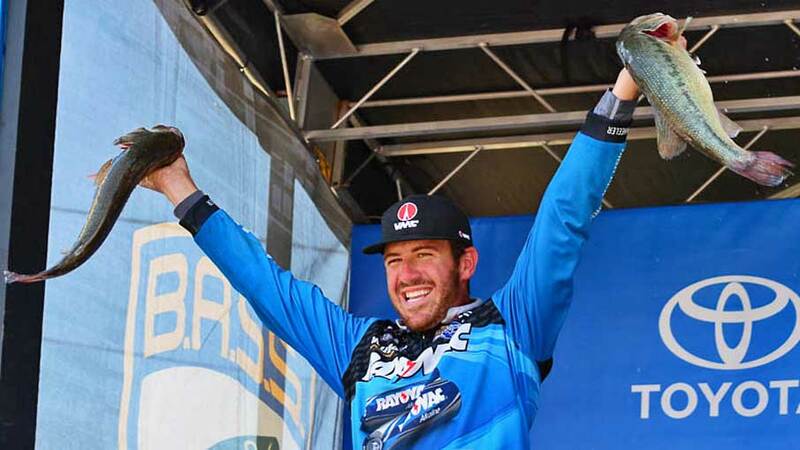 BASSfest was a rare opportunity for Wheeler to earn a Classic berth. He was one of 33 who came up through the Bass Pro Shops Bassmaster Opens Series presented by Allstate to be a BASSfest qualifier. Not being a Bassmaster Elite Series pro, Wheeler’s only other Classic avenue besides BASSfest would have been to win an Open event. To claim his BASSfest-won Classic entry, Wheeler must complete the 2014 season of the Northern Open, the division he’s currently enrolled in. Wheeler came to Chickamauga with a cache of productive spots off the beaten path. They were the product of fishing Chickamauga in all seasons and often with a Tennessee buddy he met when competing in the 2008 Bassmaster Junior World Championship in New York. Several of Wheeler’s key spots were revealed to him when the lake’s levels had fallen enough to see structure and cover. The upshot of his lake knowledge was being able to break away and not feeling forced to share water on community holes and well-known ledges of the riverine fishery. Sunday, Wheeler resumed his planned rotation of spots, both deep and shallow, beginning with one ledge he’d laid off of Saturday to decoy spectators away from it so he could rely on it for winning bass. His decision was golden. He landed 17 1/2 pounds by 9 a.m. Sunday. It was the early limit he had hoped for. He knew Elite pro Matt Herren was on his tail. And, he said, with superpro VanDam behind him, any mistakes could prove fatal. Wheeler next ran to his “swimbait hole,” a secondary ledge with a hard-shell bottom. This was the magic spot that has produced his 8-15 and two 7 1/2s earlier in the competition. There, he added two to his catch total and culled up. “The key to getting those fish to bite was coming in on top the ledge, casting out, letting the bait fall in 20 feet of water, and bringing it up the ledge into 15, and they would eat it when it got to the top,” he said. A 4 1/2 was his final keeper in 14 catches Sunday, and it gave him a 2-plus pound cull. Of all the techniques and lures he used to win BASSfest, Wheeler could not pinpoint one as most important. “They all were so key,” he said. “I caught the majority of my fish on a swimbait, but some of the bigger ones were on a hair jig, a few on a worm and some on a crankbait. The lures were a 6-inch Basstrix swimbait in Tennessee shad color rigged on a 3/4-ounce VMC Ike Approved swimbait head; a Rapala DT20 in disco shad, and a homemade hair jig. Wheeler offered a special Father’s Day salute to his father, who taught him to love fishing. “Without my dad, I know I wouldn’t be here,” the young angler said. VanDam — a 20-time Bassmaster winner including four Classics, and a seven-time Toyota Bassmaster Angler of the Year — moved up from third place to finish in second place at 84-12. VanDam’s final-day weight of 23-8 made a run at Wheeler, but began the day have to make up more than 7 pounds. VanDam couldn’t help but look back at lost fish and Saturday’s disappointment at coming to the scales without a full five-bass limit. Finishing in third place at 83-15 was Herren of Ashville, Ala. He had been just 1-1 behind Wheeler at the beginning of the final round. “I fished a perfect game plan,” Herren said. It included hitting deep-water ledges as well as shallow places. Sunday he was on a dock pattern, picking up isolated bass holding near or under the structures. Several lost bass in the 5-pound class hurt his finish. Gerald Swindle of Warrior, Ala., finished fourth to post his second consecutive Top 5 Elite Series finish. His final weight was 74-10. Fifth place was taken by Brett Hite of Phoenix, Ariz., who won the first Elite event of 2014 on Lake Seminole. His weight was 71-5. Part competition, part festival, the five-day BASSfest is a new-format addition to the slate of Bassmaster events. The competition began with 107 pros of the Bassmaster Elite Series plus 33 anglers from the Bass Pro Shops Bassmaster Opens presented by Allstate circuit. After two days on Chickamauga Lake, the Top 50 stayed on shore to meet fans at the Bassmaster BASSfest Expo while the remaining 90 anglers moved to Nickajack for a shootout. The Top 10 from the shootout rejoined the Top 50 for Saturday’s semifinal round on Chickamauga. Only the Top 12 competed Sunday for the trophy. * Toyota Bonus Bucks award of $3,000 to the highest eligible finisher: Casey Ashley of Donalds, S.C.
* Toyota Bonus Bucks award of $2,000 to the second-highest eligible finisher: Russ Lane of Prattville, Ala.
* Toyota Bassmaster Angler of the Year Bonus of $1,000 to the leader in the Elite Series points race: Davis. Elite pros did not earn points at BASSfest via their performance. Each pro who completed the participation requirements was awarded 100 points. Davis, the points leader going into BASSfest, had no trouble staying atop the list. * Berkley Heavyweight Award of $500 for the best five-fish limit: Wheeler for his Day 2 bag of 29-13. * Carhartt Big Bass of the tournament of $1,000 plus another $500 for wearing Carhartt apparel: Hank Cherry of Maiden, N.C., for his Day 2 lunker of 10-11. * Power-Pole Captain’s Cash award of $1,000 to the highest finisher equipped with a Power-Pole anchoring system: Wheeler. * Livingston Lures Leader Award of $500 for being the Day 2 leader: Wheeler. * Rigid Industries Jackpot: Rigid offers a daily prize of $250 to anglers registered for the program who produce a 25-pound or heavier bag. Unclaimed daily awards roll over into the next tournament day of the season. Awarded jackpots at BASSfest were: $2,000 to Michael Iaconelli of Pitts Grove, N.J., for posting 25-12 on Day 1; and $250 to Justin Lucas of Guntersville, Ala., for 25-5 on Day 2. *A.R.E. Truck Caps Top Angler award of $750: Hackney. The local host of the event was the City of Dayton. The Elite field travels next to Pennsylvania for the Bassmaster Elite Series at Delaware River, Aug. 7-10 out of Philadelphia.